Scott Weyerman was discouraged with his job search. After being unemployed for nine months he primarily used online resources in his search with no success. Since Scott was receiving extended unemployment benefits, he was randomly selected by the Idaho Department of Labor to meet with a workforce consultant and see how the consultant could help him in his job search. Scott was frustrated because he did not know what he wanted to do or what skills were marketable in this economy. During his meeting with an Idaho Falls local office consultant, Scott was advised to take some assessment tests offered through the department’s Career Information System to help him discover occupations of interest. He was leery of taking the assessments because he had taken similar tests in the past, but the consultant encouraged him to give the assessments a try. 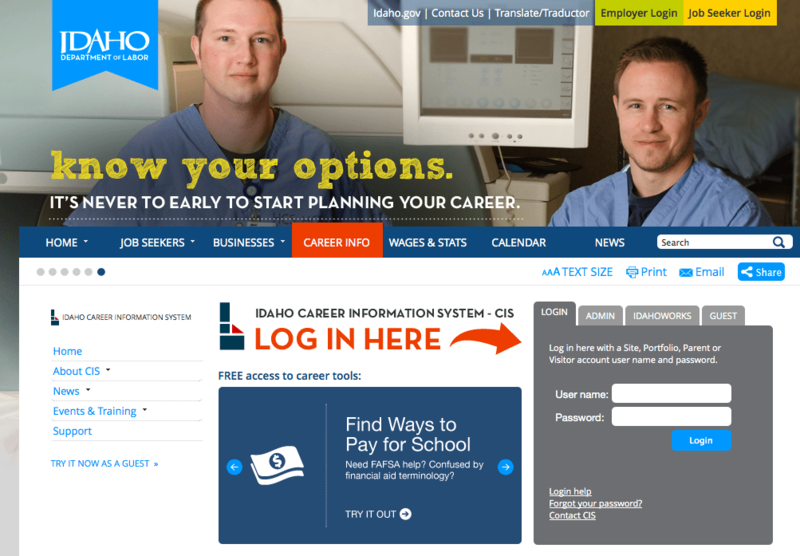 Idaho’s Career Information System provides detailed information on occupations and training to youth and adults so they can make informed career decisions and find work that fits their goals. Scott also worked with the workforce consultant to improve his resume and refresh his interview skills. Soon afterward, Scott received a call from an employer who had seen his resume. After going through two rounds of interviews, he was offered a job as a marketing support coordinator. According to Scott, it was one of the best days of his life in a long, long time. Scott says he couldn’t have gotten the job without the support and encouragement of people in the Idaho Falls office. The consultant provided someone to bounce ideas off of as well as being there just to listen. Workforce consultants are available to work with job seekers in all 25 local offices. Click here to find the office closest to you. This entry was posted in Job Seekers and tagged idaho career information system, idaho department of labor, idaho job seekers, skills assessments on February 27, 2013 by Idaho Department of Labor. Our vision is to be Idaho’s first choice for employment services. We connect job seekers with Idaho employers, deliver employment services to Idaho businesses and support people during career and life transitions.